While it was one of the longest-running titles in the DC stable, dating back to the very earliest years of the outfit’s publishing ventures, throughout the 1970s ADVENTURE COMICS felt very much like a series without a niche. When I first noticed it, it was starring the Spectre (and had temporarily added the word WEIRD to its logo) in stories that were in no way appealing to me as a six-year-old. Thereafter, it went through a series of rotating headliners, looking for something that would stick. 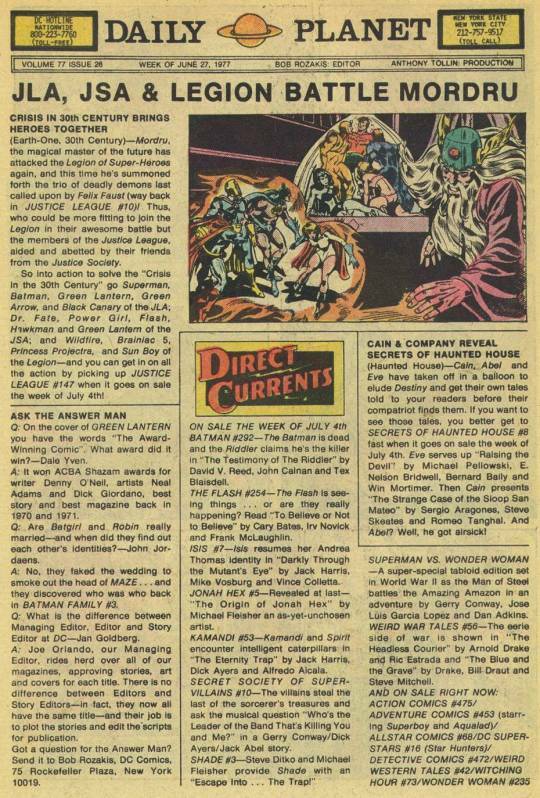 This particular issue saw Aquaman jettisoned into his own title and Superboy plugged in once again. 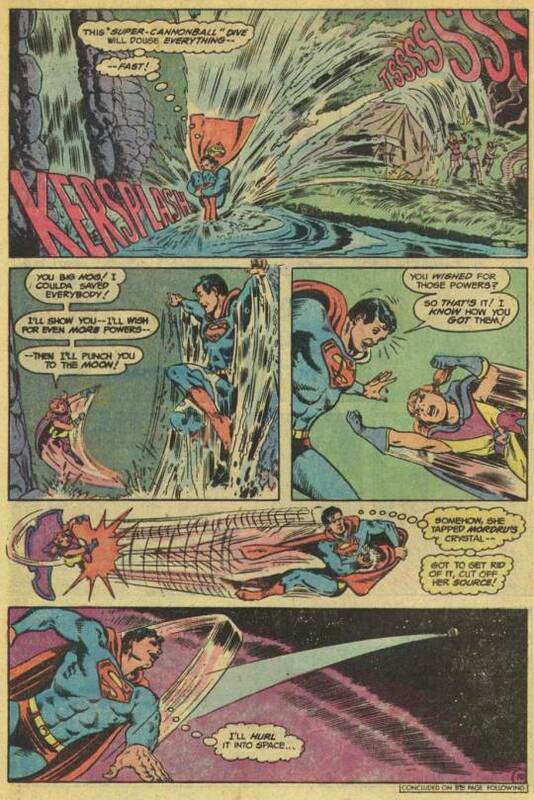 Which made sense, Superboy had decades of history in ADVENTURE COMICS before he and the Legion of Super-heroes were booted out in favor of Supergirl. The story begins with Superboy returning to the 20th Century from having visited with his friends in the Legion in the future. 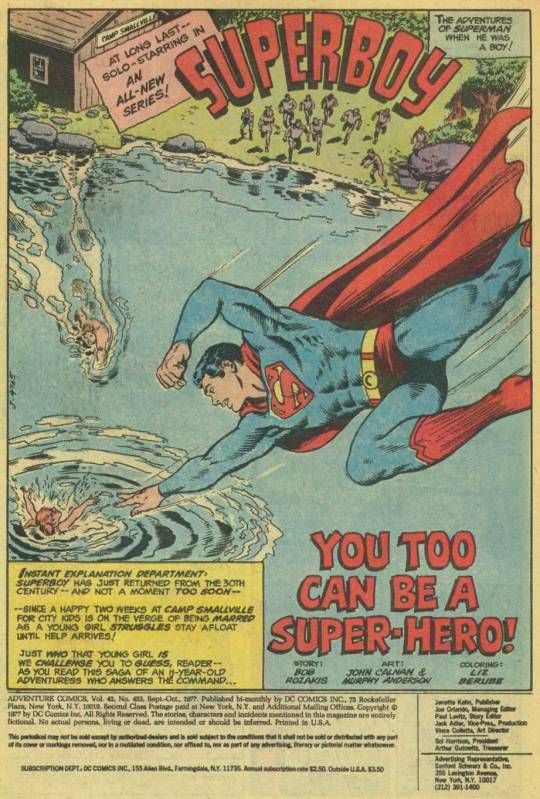 And a teasing caption challenges us to identify the little girl he immediately saves from drowning in the Camp Smallville lake.The girl is confined to her cabin at the lake because of her reckless actions in swimming out so far–and unfortunately, Superboy has brought a magic crystal back from the future and another story with him–one that reacts tot he strong desire on the part of the little girl to be a super her that it transforms her into one. Elsewhere, Clark Kent meets the girl’s older brother Tony and learns that they’re in Smallville from “the City” and that they’re the children of a civil servant. The Camp Counselors decide to prank their young charges by taking them camping, spinning ghost yarns around the campfire, and then jumping out dressed as ghosts to scare them. Tony has to pull a book on Women in Politics out of his sister’s hands in order to coerce her to join them. This turns out to be a bad idea, though, in that as soon as the “ghosts” appear, the girl transforms into Mighty Girl, and slugs Clark Kent, irresponsibly dressed as one of the ghosts, hard enough to propel him out of the clearing. 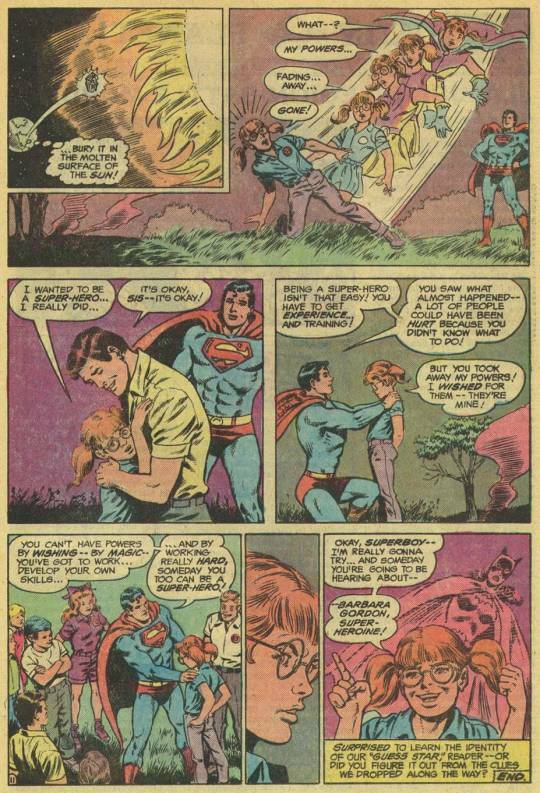 Clark swiftly switches to Superboy and has to intercede to protect the other disguised Counselors from Mighty Girl’s overpowered wrath. She’s in no way happy to see the Boy of Steel, thinking that he’s going to steal her spotlight, and so she attacks Superboy as well. A fire breaks out on the ground as a result of their bout, and Mighty Girl’s attempts to put it out only make it worse. 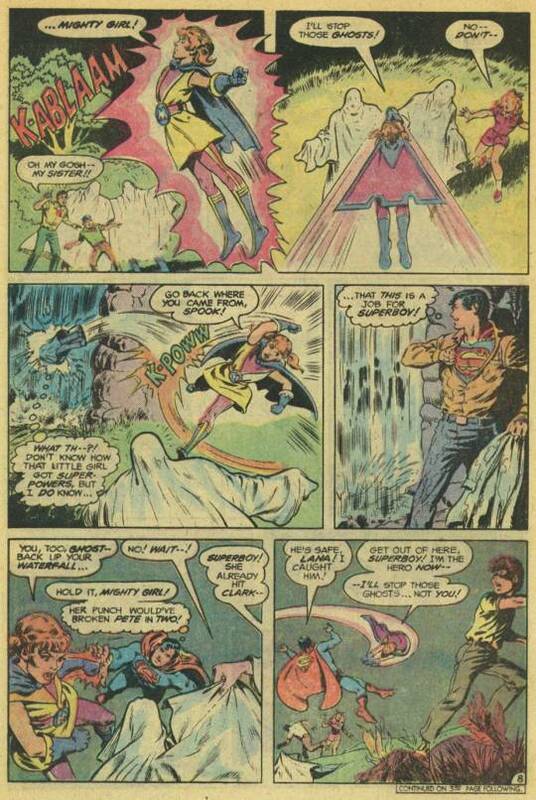 Superboy extinguishes the flames, and then realizes from what Mighty Girl is saying tat the thing responsible for her new powers is the magic crystal he’s still carrying. So he hurls it into space. With the crystal destroyed in the sun, Mighty Girl loses all of her powers and reverts to her normal form. 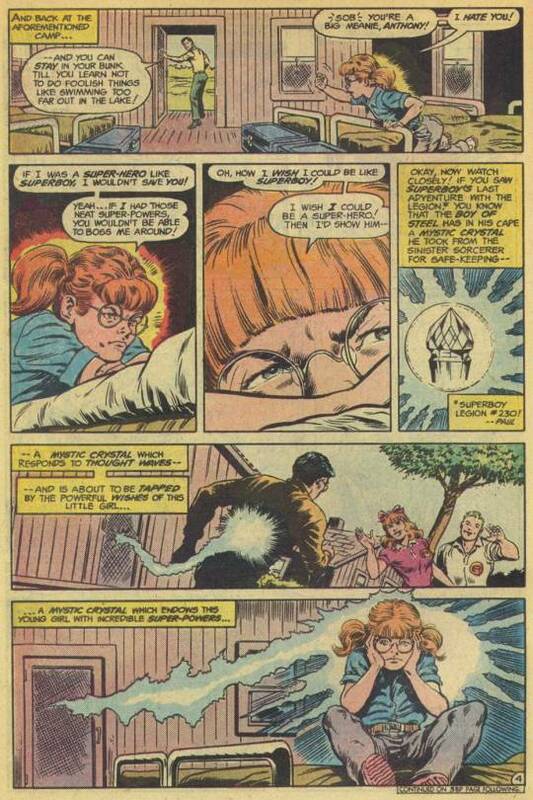 Superboy tells her that powers granted by wishing are a cheat, that she needs to develop her own skills in body and mind, and then she’ll really be ready to be a super hero. And in the final frame, the girl confirms her relatively-obvious identity as Barbara Gordon, Batgirl, who tells Superboy that that’s exactly what she’s going to do, and that he’ll hear more from her in the years to come. The Daily Planet feature that ran weekly in most DC titles gave me a heads up that a new issue of JUSTICE LEAGUE OF AMERICA would soon be arriving in my mailbox, this one the yearly team-up of the JLA and the JSA, with the Legion of Super-Heroes thrown in for good measure. In these pre-Internet days, pages like this one were one of the few ways a reader could find out about what was upcoming in the weeks ahead. I could also expect a new issue of FLASH, though the write-up for that story was so vague it didn’t really tell me anything. 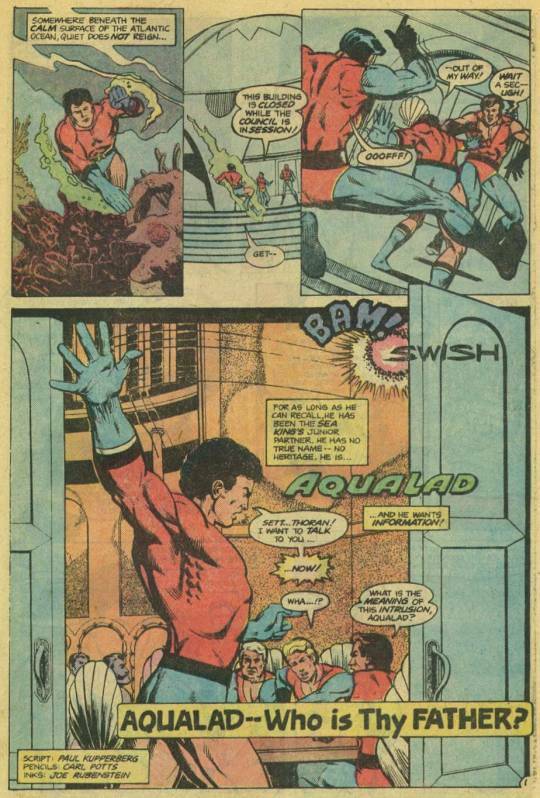 The back-up story, presumably a hold-over from when Aquaman was going to continue to be the lead feature, was an Aqualad solo tale, the first in a short series. To be honest, I fount it to be dull and unengaging, concerning Aqualad’s search for the secrets of his birth and his true parents. It had decent art from a young Carl Potts, though, so it felt just a little bit more modern than the Superboy story before it, at least in visual terms.